How many of you fashionistas are Superbowl fans? Bloomingdale's is unveiling a special collection of 48 helmets designed by the CFDA's top fashion designers. The "Couture" helmets by designers Betsey Johnson, Alice + Olivia, Marchesa, Diane Von Furstenburg and others will be auctioned off to benefit the NFL Foundation. 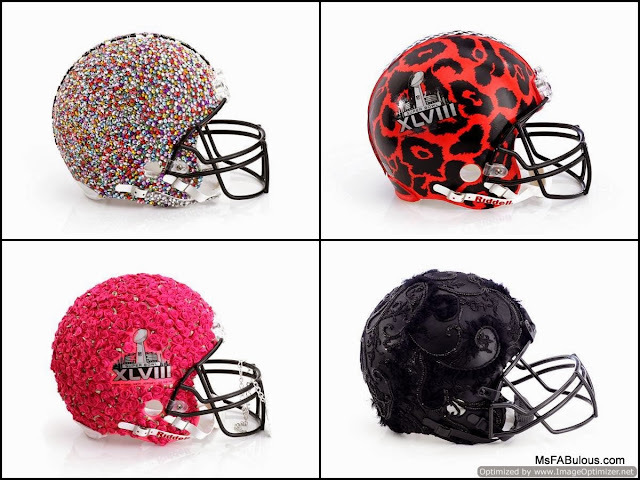 The helmets will be unveiled in Bloomingdale's 59th street NYC windows today, the launch of the auction. The NFL Foundation's mission is to improve the lives of their fans through health initiatives and grants to youth and school programs. You can place your bid at the CFDA Bloomingdale's Superbowl auction before February 4, 2014. Other participating designers include Alejandro Ingelmo, Alexis Bittar, Ovadia & Sons,Billy Reid, Blake Mykoskie for Toms, Bloomingdale’s, Catherine Malandrino, Cynthia Rowley, Cynthia Vincent for Twelfth Street, Dana Lorenz for Fenton/Fallon, Danielle Snyder and Jodie Snyder for Dannijo, Dao-Yi Chow and Maxwell Osborne for Public School, David Neville and Marcus Wainwright for Rag & Bone, Dennis Basso, Diane von Furstenberg, Donna Karan ,Eugenia Kim, George Esquivel, John Varvatos, Junkfood, Kenneth Cole, Lela Rose, Badgley Mischka, Mark McNairy, Michael Bastian, Monique Lhuillier, Narciso Rodriguez for Narciso Rodriguez Studio, Nicole and Michael Colovos for Helmut Lang, Nicole Miller, Olivier Theyskens for Theyskens Theory, Gela Nash & Pamela Skaist-Levy for Pam & Gela, Pamela Love, Rachel Zoe, Rebecca Taylor, Richard Chai, Rogan Gregory and Scott Mackinlay Hahn for Loomstate, Rogan Gregory for Rogan, Rozae Nichols for Clover Canyon, Sam Shipley and Jeff Halmos for Shipley & Halmos, Stephen Dweck, Steven Alan, Tadashi Shoji, Todd Snyder, Vince Camuto, and Yigal Azrouel.